apartments, houses and offices, as well as construction of any complexity “turnkey”. 2015 our company works on the Georgian market of repair and construction services. For many years of experience we have proved ourselves as a conscientious and professional partner. We use only high-quality construction and finishing materials. 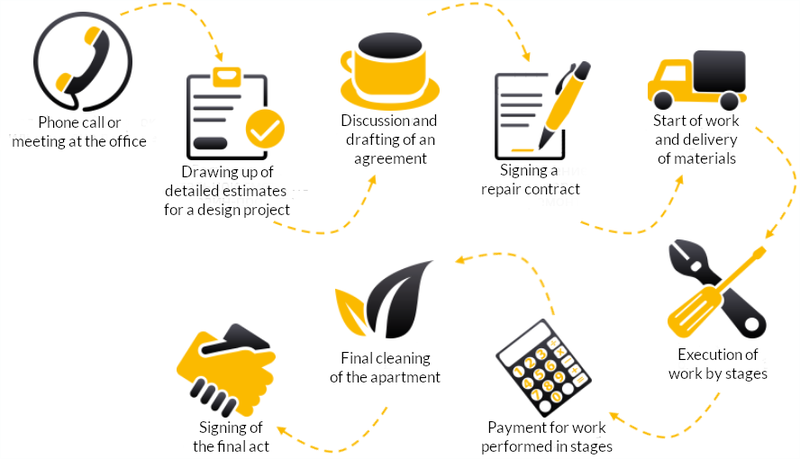 Repair of apartments “on a turn-key basis” is a complex of works, including: decorative furnish of premises, electricity, the sanitary technician, heating, ventilation and air-conditioning, floor coverings and many other things. We carry out repair work at a high level, including the work of the premium class. Turning to us, you get a guarantee in the form of a contract with a description of all the works performed. The cost and the terms of the order are stipulated at once. In their work, UBC employees are focused on maximum customer satisfaction, as the best advertising of our services is the number of satisfied Customers ready to give positive characteristics. We guarantee high-quality work and a personal approach to each Client!